Does a New Roof Add Value to Your Home? Try EPDM Rubber! You’ve been weighing up the pros and cons of a new roof installation. Will a new roof be too expensive? Will it be a long, drawn-out process to get it installed? Does a new roof add value to your home? While a new roof can seem like a high-cost investment, the benefits that you get from it will definitely be worth the initial cost. Below, we explain why an EPDM rubber roof is a great choice for a new roof installation and we explore how it can increase the value of your home. What is an EPDM rubber roof? EPDM rubber is a high-performance roofing material that is frequently used on flat and low sloping roofs. This material is a top choice for roofing experts because it is long-lasting, weather resistant and dependable. It is also a very fast and safe process to install an EPDM rubber roof to your property. Is a rubber roof worth the money? 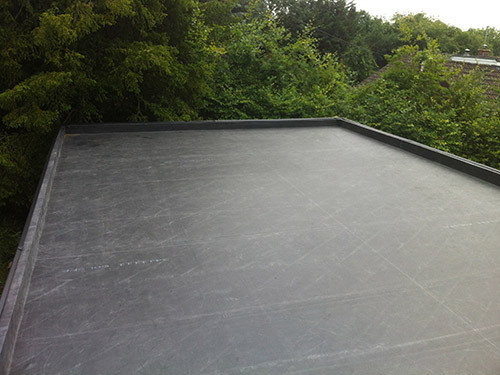 We believe that an EPDM rubber roof is worth the costs in the long run, simply because it is so sturdy and dependable. It can survive in all types of weather conditions, from extreme heat to heavy snow, and it is unlikely to need replacing for many, many years. It also requires minimal maintenance – this means you won’t have to cope with further costs in the future, such as fixing holes or getting it patched up. How does a new roof add value to your home? A long-lasting roof is all well and good, but if you’re thinking of selling your property in the future, you might be wondering: does a new roof add value to your home? Well, the answer is yes! Potential buyers will be impressed by the look of a smart new roof, without any cracks, worn patches or debris. On top of this, they will also be highly reassured that they won’t have to look at replacing it themselves. A useful tip is to keep all the evidence of your new roof purchase so that you can clearly show buyers that you have invested in the property for the future. Investing in a new rubber roof is a fantastic way to increase the value of your property. However, you need to make sure that you are using high-quality materials and that you hire a professional for this installation. Otherwise, all your money may end up going on a botch job that won’t increase your property value! Get in touch with Plytech today if you are interested in investing in a new EPDM rubber roof with a 20 or 30 year warranty and a life expectancy of around 50 years!